When it comes to making any type of flatbread pizza let imagination and the season rule your toppings. I love a caprese style pizza when there is an abundance of vine ripe tomatoes. 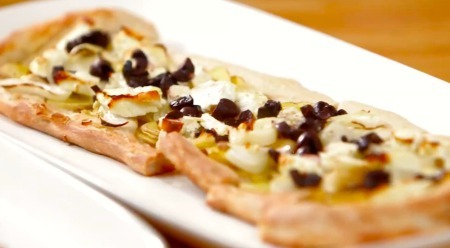 My white flatbread pizza is also a crowd pleaser with its warming crunchy toppings. Drizzle top with olive oil before baking. Mix Dough and place in a bowl lightly coated with olive oil. Cover loosely with a towel or plastic wrap. Place in refrigerator overnight. Place toppings in this order on dough; potatoes, onions, feta, olives and olive oil. Sprinkle slightly with sea salt and fresh ground black pepper. Bake for 8-10 minutes or until pizza flatbread crusts are fully baked. You can check for doneness by tapping on the edge of the dough with your finger. It will have a hollow sound when done.